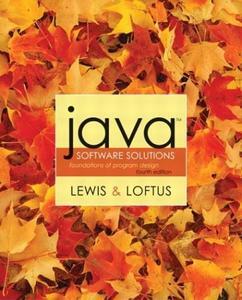 This book takes an object-oriented approach to Java using the Java 1.5 release in a way that is appropriate for those just learning to write high-quality programs. The book features both text-based and GUI-based examples to demonstrate computing concepts and provide readers with maximum versatility. This new edition has an earlier evolution of object concepts, developed in a way that capitalizes on the power of objects without overwhelming beginning programmers. It places less empahsis on applets and more emphasis on GUI-based applications, while still maintaining a clean division between graphical and non-graphical topics. This book is appropriate for beginning programmers who want to learn to program with Java as well as experienced programmers who want to add Java to their skill-set.